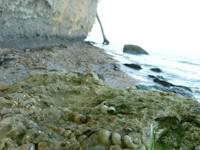 There is a layer roughly 15-20 ft up that is chalk full of fossil Turritella Gastropod molds. This layer is collapsed along some sections of the Potomac Cliffs, which means huge rocks are laying on the beach that are full of the gastropod molds. The Potomac River can be a scenic place to collect at. However, the vegitation and trees make it a little difficult to fossil hunt. Toward the end of summer, seaweed and mats of algae bloom in bays along the potomac. 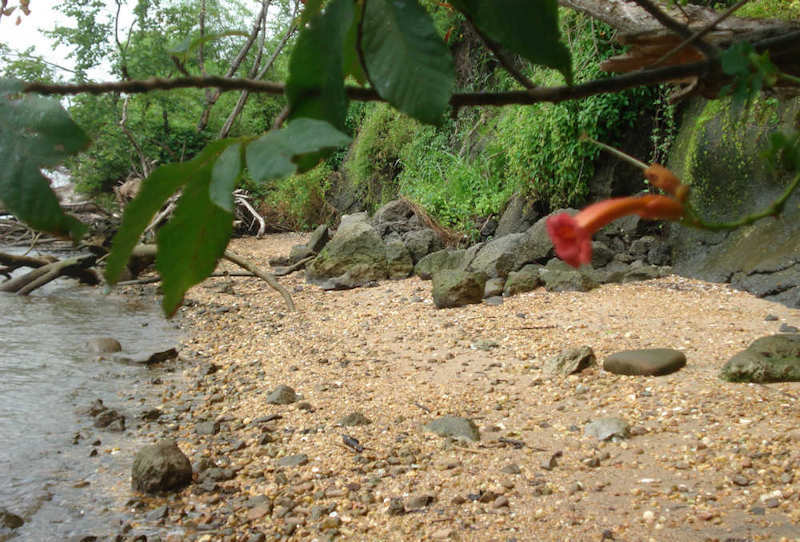 These aquatic plants often wash ashore and cover the beach in a stinky muck. It makes it difficult for fossil shark tooth hunting. Looking for Fossil Shark Teeth along the Potomac River. Watch out for the trees. fossil collecting with all the down trees can make it a little cumbersome. 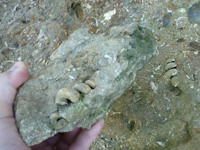 Fossils found along the cliffs of the Potomac River just south of D.C. are from the Aquia formation, which is from the late Paleocene (Selandian). This time period marks the final ending of the supercontinent Pangaea, as the last vestige split apart into Antarctica and Australia. At the end of the Paleocene, the climate was also warming from the cool Paleocene climate into the tropical climate of the Eocene. Another special event in the Paleocene is the development of grass. Without the evolution of grass, mankind would have long perished from lack of cutting it. As in the Eocene and Miocene, this area was just offshore in the young and much narrower Atlantic Ocean. The fossiliferous deposits contain mainly shells, fish, and fossil shark teeth (including the fiercest shark of the Paleocene, Otodus obliquus), ray plates, and crocodile and turtle material. 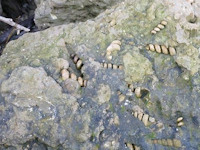 These deposists are too old to find marine mammals, as mammals did not return to the sea for another 4 - 6 million years. Other fossil bearing formations pop up along the Potomac River, both north and south of the Aquia formation. Sometimes small lenses of the Eocene Nanjemoy formation can be found. 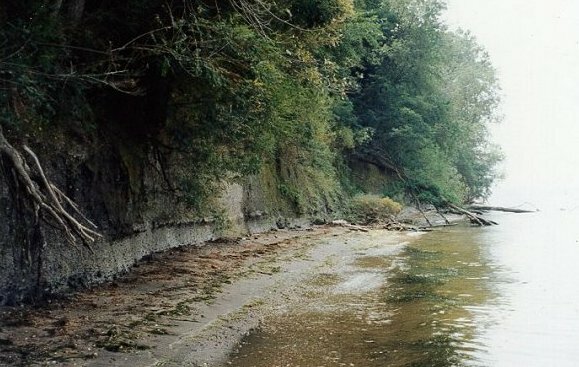 Further South along the Potomac near Westmoreland State Park are cliffs that contain Miocene fossils from the Calvert Formation. These are the Horsehead cliffs. 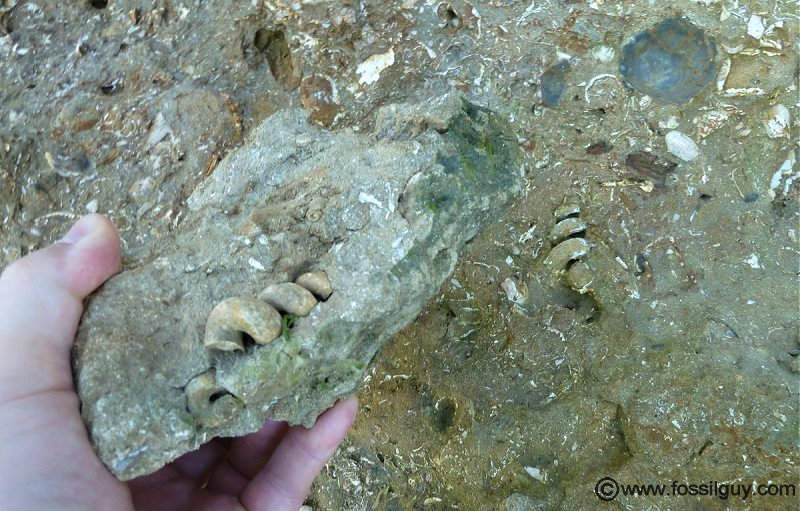 For information about these Miocene fossils along the Potomac, go to the Calvert Cliffs Page. 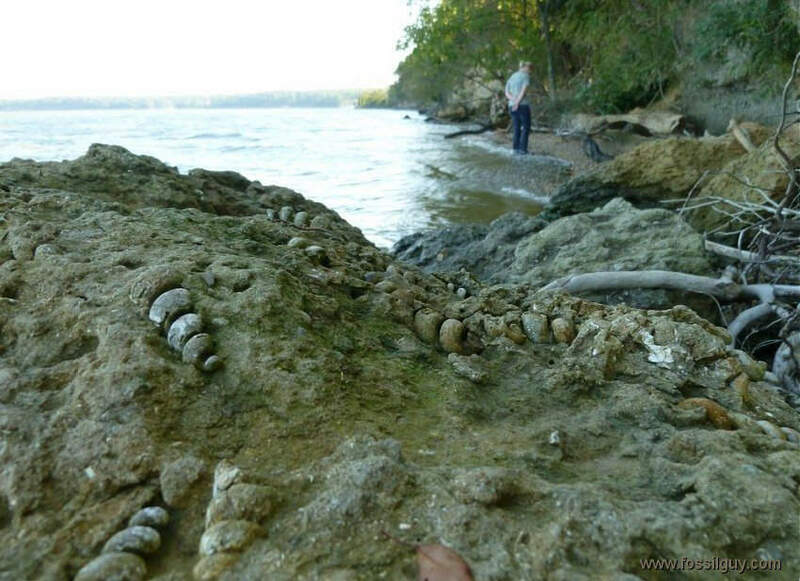 Potomac River Fossil Identification - Paleocene. 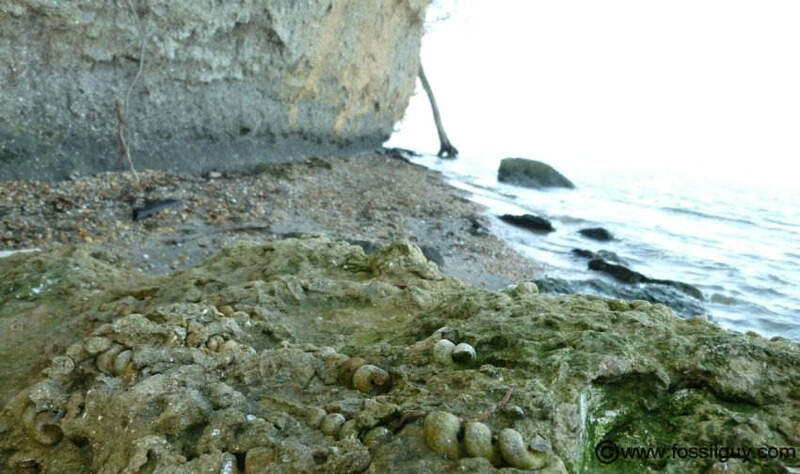 When looking for fossil along the potomac, please remember that private property starts at the LOW tide line in VA, therefore, all beaches in VA are private property. In MD, private property starts at the HIGH tide line, so you must stay below the high tide line in MD. Access is limited, especially without a boat and VA property laws. Look for parks near the Potomac river that have river access. The VMNH takes field trips to places along the potomac. For information about their public field trips, click here. Although the Potomac is a river, it is tidal. The tides are not extremely high or low, however, they easily flood the small beaches where the fossils are. Often times when collecting, I will start at low tide, then have to walk through knee and sometimes waste deep water when returning to my starting point. Which is often difficult because of all the fallen trees. 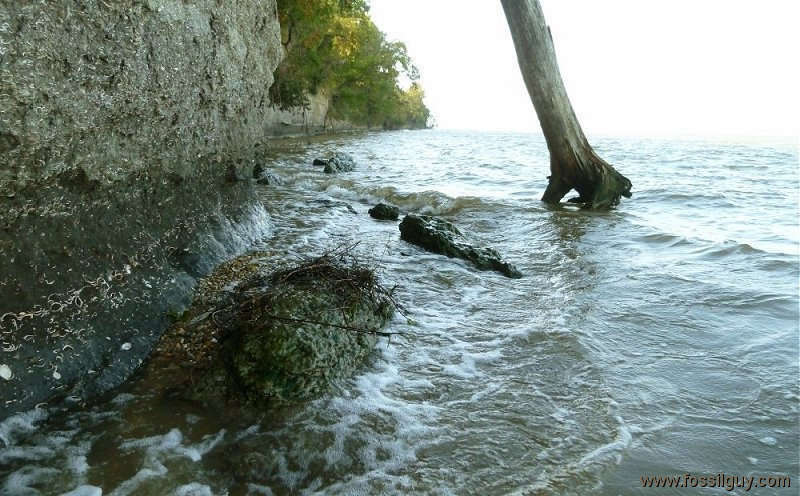 The following link has tide data for numerous places along the Potomac river: SALTWATER TIDES - Potomac River. A small Shovel and Sifter with a 1/8" - 1/4" screen. A shovel and sifter is ideal for sifting the pebble areas along the Potomac river. Please remember to DO NOT DIG IN THE CLIFFS, as the cliffs are provate property, plus they can collapse and cause serious injury and death. If one doesn't have a shovel and sifter, one can still find fossils by simply scanning the grownd. Slowly walk the pebble areas by the shore and scan for fossils. • Waders, or thick bottomed shoes - There is sometimes glass mixed in with the pebbles. • Bug spray - there are lots of mosquitos and biting flies along the river, plus there are lots of fallen trees and vegetation, so ticks can also be an issue. • Water - It gets hot in the summer, don't get dehydrated! Shark Tooth Ocean Sifter 11" This is an 11-Inch sifter with a 1/4 inch mesh, ideal for shark tooth sifting. It is lightweight and floats, which is great for sifting in rivers and bays! Iunio Military Portable Folding Shovel [17 inch Length] If you don't want to carry a big shovel while sifting, this little one does a good job. You can fossil hunt here any time of the year. However, some times can be better than others. 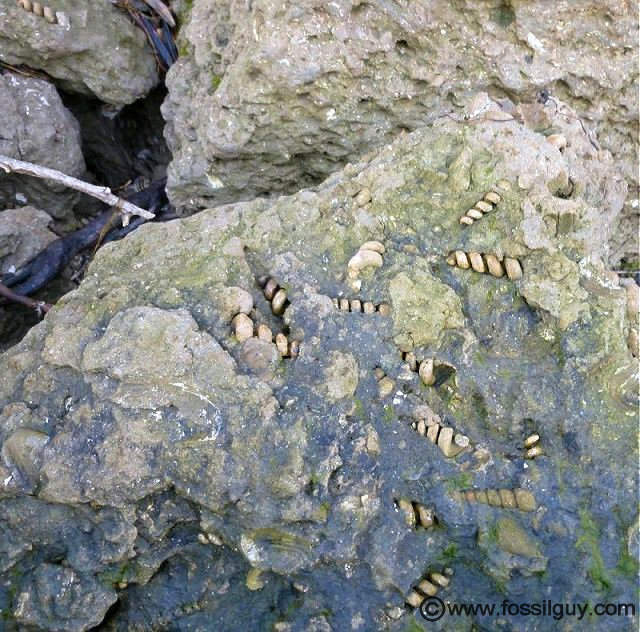 It's best to fossil hunt a day or so after a heavy rain, or after the freeze/thaw cycles in early spring. These events cause more fossils to erode and washes up fossils from offshore. Fossil hunting during a rain storm is not recommended, as the river can quickly flood. 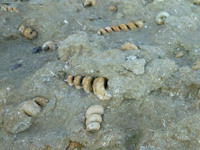 Fossil hunting in mid-summer during a drought is more difficult, as fewer fossils will have eroded out. Also, toward the end of the summer, algae blooms and seaweed tend to cover most of the pebble areas. Origins and Evolution of Sharks!